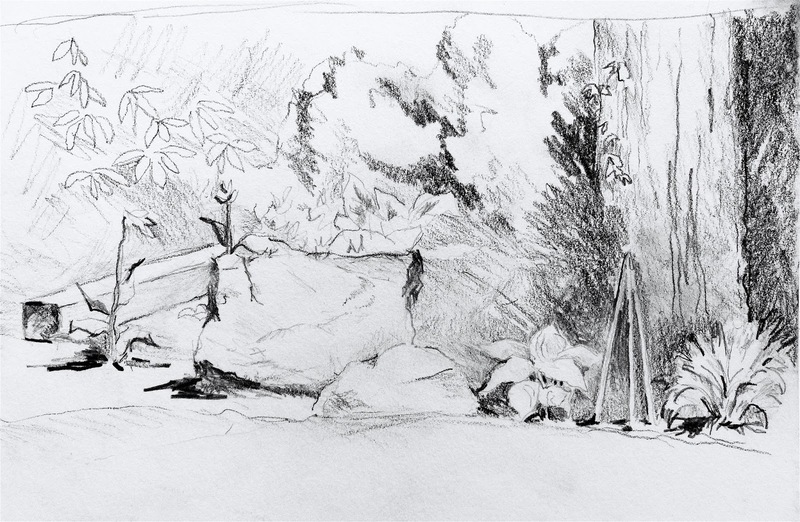 During the past week, I've tried to loosen up (again) by painting outdoors. 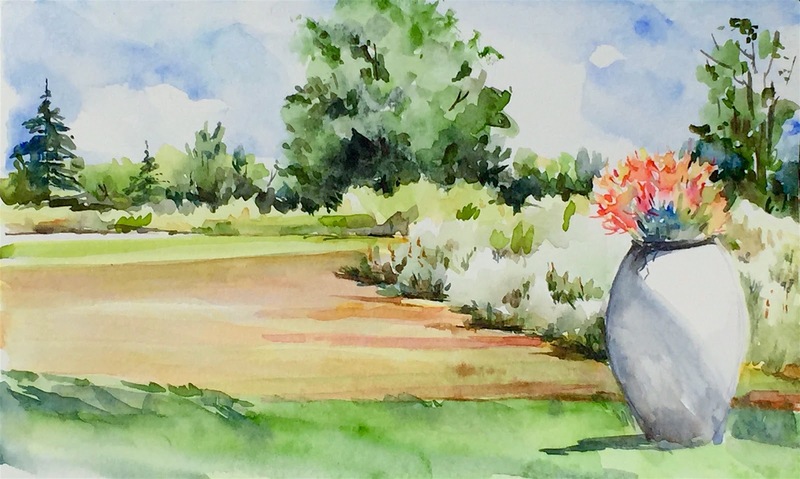 Not my favorite setting for doing watercolors, but it is a great way to become better at sketching quickly and learning the best way to capture a scene's contrast re sunlight and shadow. 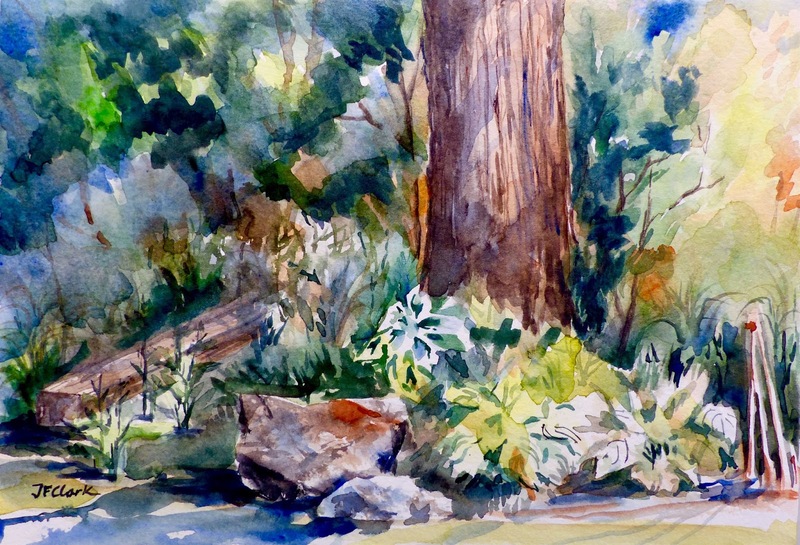 On Saturday, July 16, I joined a painting workshop at Tower Hill Botanical Garden in Boylston, MA. It was facilitated by Charlotte Wharton, also of Worcester, MA. (You can visit Charlotte's website here ). The weather was beautiful -- sunny, hot, with a slight breeze -- and the group of twelve or so was very congenial. I met (and exchanged contract info) with several other painters -- always a plus!! We were seated in the morning near a large memorial urn that overlooked a grassy area near some woodlands. The sunlight cast interesting shadows, and the foliage in the far background was in deep, deep green contrast to the somewhat dry grass. 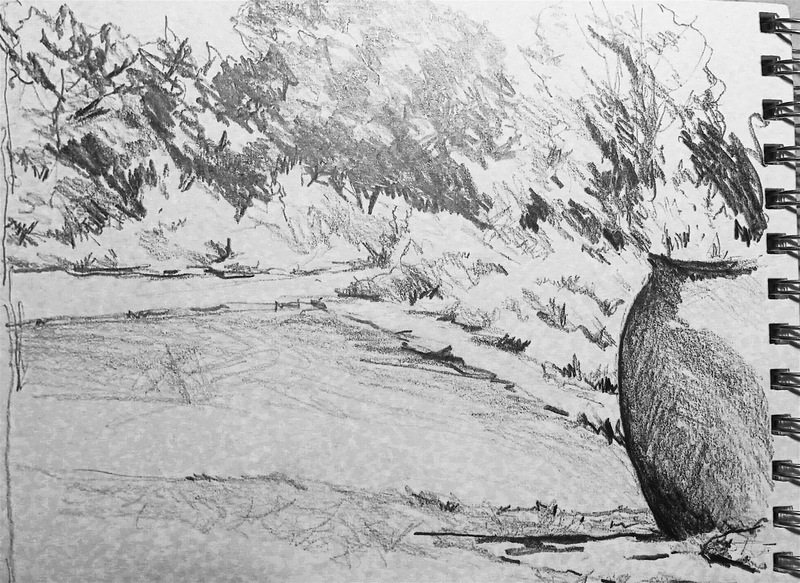 I spent about 45 minutes doing a sketch, trying to render the urn shadows properly. Then, I pulled out my small Winsor & Newton travel set which I've filled with my eight favorite colors of professional grade W&N watercolors in half-pan size. I also used a W&N water-soluble WC stick, in Perylene Green (this color was not available in a half-pan size when I visited the Cheap Joe's store in Boone, NC last summer...). 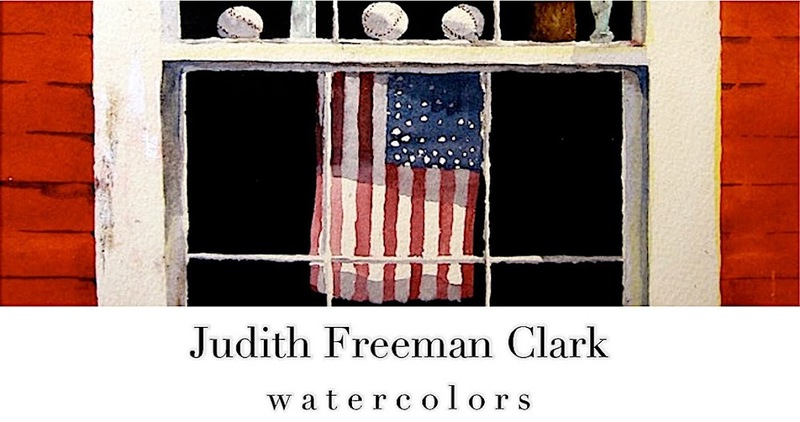 The WC sticks are interesting as they can be used like crayons but are water soluble, so they can also be treated more or less like a cake of watercolor paint. Fast-forward a few days to July 22. I was juggling new-puppy-duty with my need to get outside and paint. The solution seemed to be to go out in my smallish backyard and set up a painting station in the shade -- hoping that Annie, our new puppy, would settle down nearby. She was (reasonably) compliant, which gave me a chance to sketch a thumbnail and to almost finish a 7" x 10" sketch of a corner of our "rock" garden. (You can't avoid having a garden in most places in New England without accepting that it'll have a few picturesque rocks in it). We have some hosta plants mixed in with some of the other greens, all of which is planted underneath our only remaining shade tree. (We had two removed last year due to the precarious quality of the branches.) While I don't feel this thumbnail is anywhere near "good enough," At least I spent several hour sketching and painting this afternoon -- despite the near-90-degree heat AND the rambunctious pup! 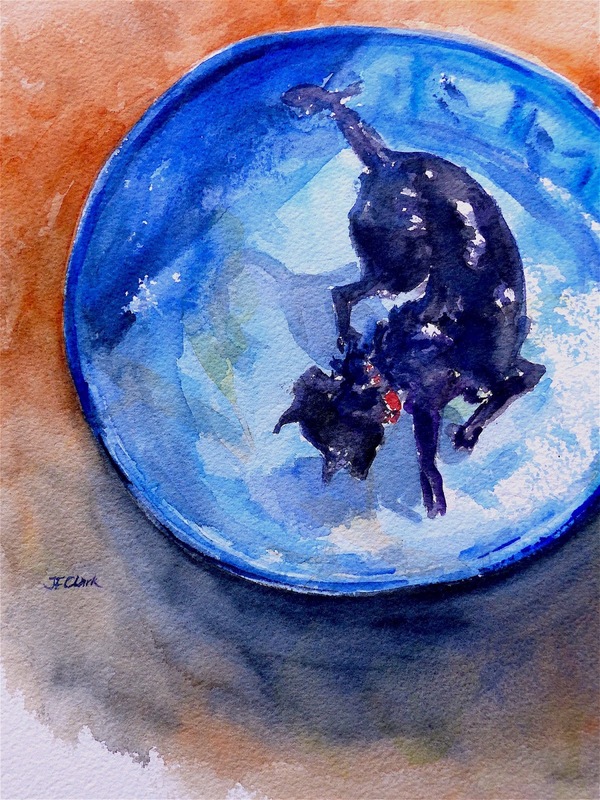 Finally here's a freehand watercolor sketch I did of Annie in her blue plastic swimming pool. I painted it on a hot day, without a doing a preliminary thumbnail.